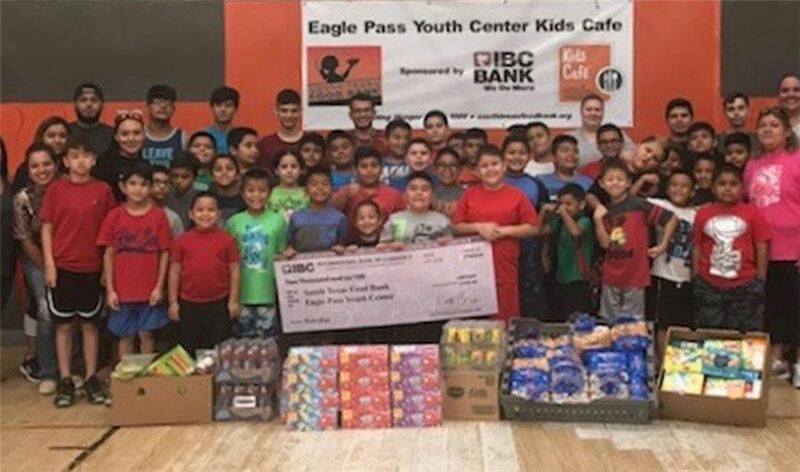 (JULY 30, 2018) EAGLE PASS, TEXAS - IBC Bank-Eagle Pass provided the South Texas Food Bank with a contribution that will finance the Kid's Café summer 2018 program at the Eagle Pass Youth Center. IBC Bank has teamed up with the South Texas Food Bank for more than 12 years and is a major contributor to the fight against hunger. Kid's Café is an after-school program that offers nutritious, well-balanced, hot meals to children at risk of hunger. This initiative provides local children, ages 17 and under, a grassroots approach to alleviating childhood hunger and promote self-esteem and individual development. "Being able to give back to our community is part of IBC's philosophy to "Do More", said Hector Cerna, IBC Bank-Eagle Pass CEO and president. "We are proud to partner up with the South Texas Food Bank and the Eagle Pass Youth center to keep children well nourished so they can enjoy their summer and bring awareness to this significant issue." The South Texas-size check presentation was commemorated by IBC Bank Area Teller Supervisors Yadira Villarreal and Maria Ramirez, who were joined by Eagle Pass Youth Center Director Alfonso Mallen, South Texas Food Bank Director Alma Boubel and South Texas Food Bank Kid's Café Coordinator Mario Factor.